On one of my trips through the Levinsky Street market, I happened to have a rather fabulous cooked wheat-bulgur dish at Niso, a Turkish restaurant. I’d never had anything like it, but I could tell that it contained fried peppers and onions, tomato or tomato paste, and some spices. Several weeks later, in my own kitchen, I whipped up my own version of the dish as I remembered it. I fried some vegetables that seemed appropriate, cooked them with the bulgur and added nutmeg and cloves, which gave me the taste I thought the dish should have. Then I compared my result with recipes in the outside world. And lo and behold, there are about half a million hits on Google for “Turkish wheat bulgur recipe.” They’re labeled things like wheat pilaf and wheat bulgur salad, and most of them bear a strong resemblance to what I made. A quick glance found many call for butter or broth — things I didn’t use — and some contain lemon, while I saw one or two with unusual ingredients like pomegranate molasses. Surprisingly, my quick survey didn’t turn up any other recipes with garlic, or anyone else who used nutmeg and cloves. I imagine some do, though. That, or I’m completely original. 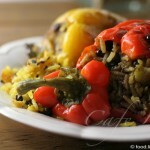 So, without further ado, here’s my take on Turkish bulgar pilaf. We very much enjoyed it, I should add. Chop the onions and peppers, and fry in a thick-bottomed pot with some oil. 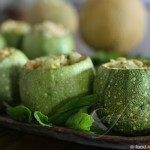 Once they begin to soften, crush and add the garlic. Once the garlic is browning, chop and add the tomatoes. Add the rest of the ingredients to the pot, except for the parsley. Cover, bring to a boil and let simmer until the bulgur is soft. 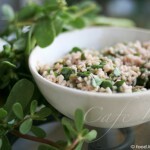 Chop the (optional) parsley and toss it with the cooked bulgur, or use as a garnish on top. 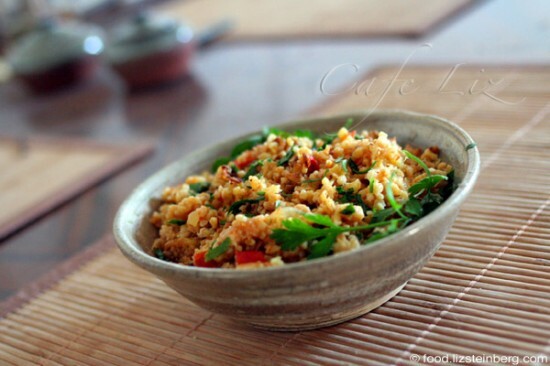 3 Responses to "Turkish-style bulgur with tomatoes and peppers"
Wow, Ayelet, that was quick! Glad to hear it.